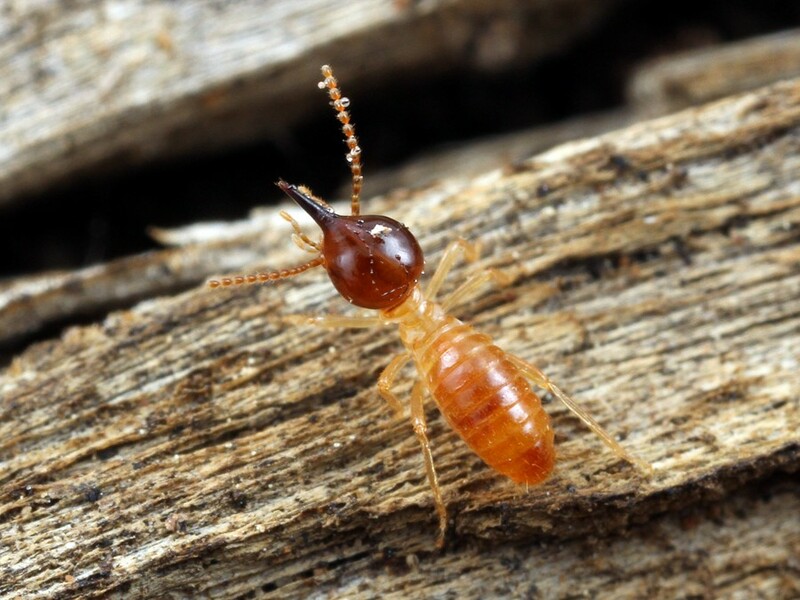 Australian homes are lost every year to natural disasters such as fires, floods and cyclones, but let’s not forget the termite, a tiny creature that has caused millions of dollars in damage, often without anyone noticing until it’s too late. Many home owners have experinced that sinking feeling when they have taken a bit of plaster off the wall and spotted the dreaded “white ants” scuttling for shelter in the timber framework. 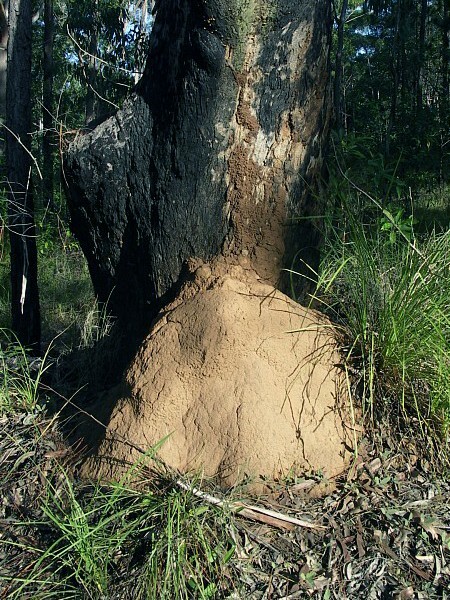 But despite this, termites also play an essential role as bush gardeners, cleaning up fallen trees and other detritis, eventually returning nutrients to the soil to fertilise new growth. 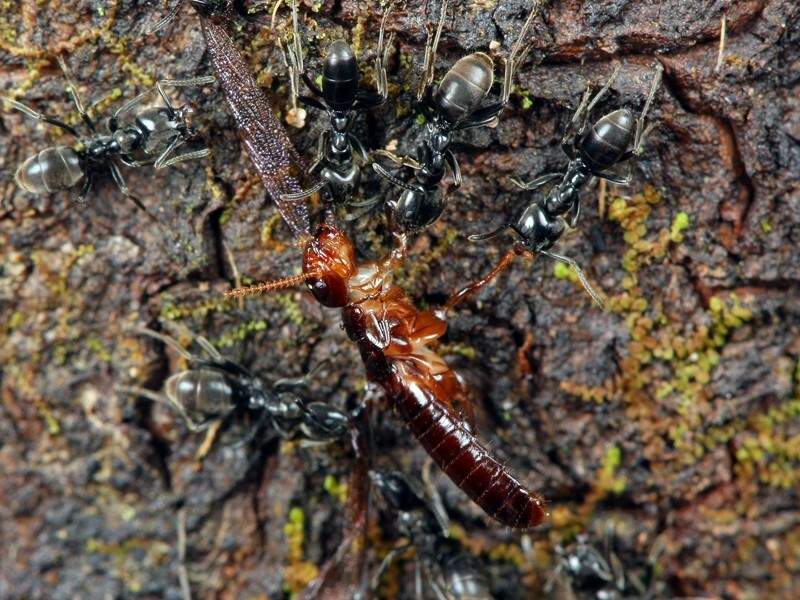 I’m sure they don’t appreciate it, but termites also provide a healthy meal for many other creatures, big and small, which I suppose is nature’s way of keeping populations in check. 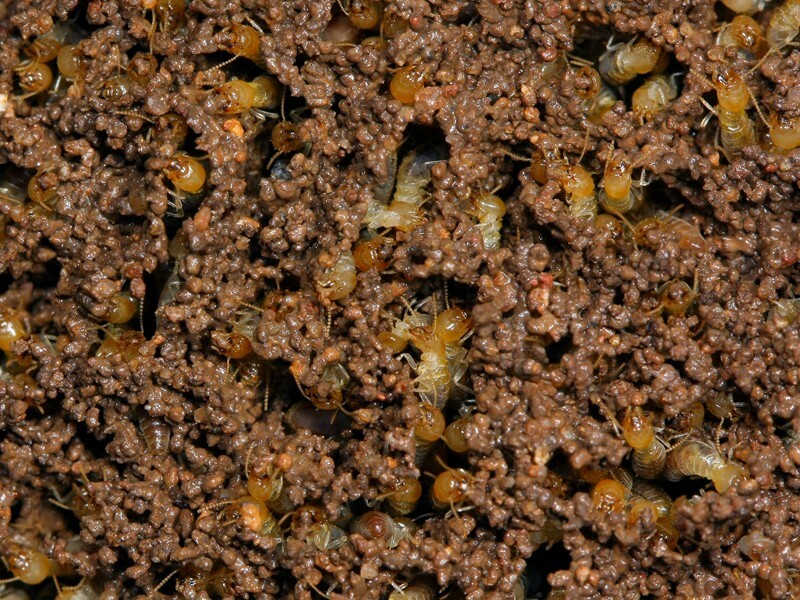 Termites are social creatures, living in colonies that consist of many thousands of individuals. Nest structure varies from species to species, the most noticeable being the large mounds that can reach over two meters in height. They are constructed from chewed wood pulp, soil and mud, and are designed to regulate temperature, humidity and oxygen flow, as well as providing adequate living space for the residents. Each colony has a caste system, with each caste having a specific function. At the centre of it all is the queen and king, the mother and father of every member of the colony. The queen is by far the largest member and can get so big that she is virtually incapable of moving. Her sole function is to lay eggs, something she is very proficient at, laying up to 2,000 eggs a day. 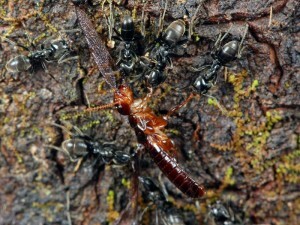 The worker castes are the providers for the colony. They are the ones that collect the food, take care of the young, and construct and maintain the nest. They are the smallest members and are blind and usually pale in colour. The defenders of the realm are the soldier castes. They have large, armoured heads that are fitted with powerful jaws custom-built for combat. The soldiers in some species also have tubular structures on their heads, from which they can spray a toxic substance at their attackers. Yet others have heads that can be used to plug small breaches in the nest. They are selfless and fearless and will not think twice about making the ultimate sacrifice to save their colony. And then there are the future kings and queens. During the warmer months of the years, winged males and females leave the nest in large numbers and head off in search of a mate and a suitable spot for a new home. Not all journeys are successful, with many falling prey to birds, mammals, insects and spiders. As I mentioned earlier, termites are herbivores and their diet can vary from species to species. Some prefer dry wood, some damp wood, some grass, while others grow their own fungus gardens for food. 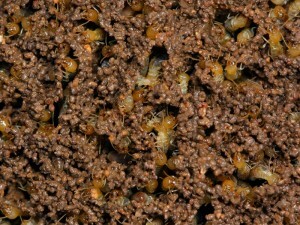 Termites may be an unwelcome sight in your home, but they are key players in the environment, acting as rubbish collectors and recyclers, somewhat like their closest relatives the cockroaches. A Nasutitermes sp. soldier standing guard. The point on its head is a nozzle from which it sprays defensive chemicals at attackers.